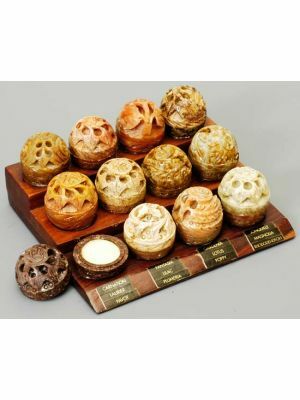 A beautiful and compact way to display Song of India hand carved soapstone jar solid perfume testers. Let your customers smell the exotic fragrances of the solid perfume before they pick out their beautiful carved jar. This display is customizable. Select your 8 tester scents. Comes with: Elegant wood display with label of each of 8 tester perfumes attached. **Free product (4 pcs) provided with purchase of tester and 3 pcs of each scent.